The Bodhi-Tree meditation is based on the symbol of a tree, a banyan tree, which provides a multi-layered, rich, and complex symbol of the self and its journey towards enlightenment. Here we describe the symbol and its various levels of meaning. The Bodhi-Tree or wisdom-tree is the world tree, and its roots drink deep of the waters of infinity. Its branches and leaves blow in the winds of the Void, and it is lit by the clear light. It is a tree of refuge, a place of safety from the raging tigers and dragons of desire. This world tree, the Bodhi-Tree, unites all worlds, and it has no guardians to protect it. All sentient beings are welcome to gain as much wisdom as their minds can hold. But it is a long journey to that state, for the traveler must unravel the current life and many other past lives to see the components that have been woven together into the patterns of life. Then the strands must be woven again, to create a mind capable and worthy of returning to the source. 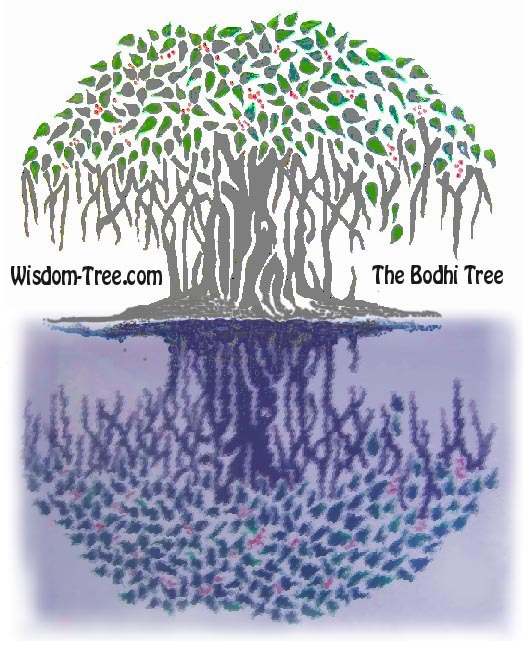 The image of the Bodhi-Tree at this site has two components - the tree itself and its reflection. The tree represents life which is outwardly full of desire, sorrow, and ignorance. Its reflected image represents life's perfection. It is life as reflected by pure, clean, awareness. It is what life can be in its ideal form and when understood in its true nature. Here, life is a set of changing reflections with no permanent anchor in physical form. The tree reflected in the water is like the self reflected in awareness. From a distance and without close examination, the tree like both the person and physical world appear to be whole and consistent things. Without meditation, physical forms appear solid and enduring. Their changing and fluctuating nature is not visible. The only direction of change is from one physical form to another. With meditation on the stages of the wisdom-tree or four watches of the night, multiple levels and directions of change appear. Both physical forms and individual personalities can be broken down into their component parts and the person can study the origin of these parts. There are components within components and reflections within reflections. As the physical tree becomes the reflected tree, it becomes shadows dancing on waves and its solidity disappears. So it is with the self and the world. Each must be recognized as parts of a larger whole, and waves upon the ocean of change. While the mind of the individual starts out as a closed and tight center of awareness, as it relaxes and opens, it starts to look like a water-lily in a lake, and then begins to resemble the lake itself. One is no longer an observer watching the mind from a distance. One becomes awareness immersed in awareness, like a water droplet in the depths of a lake. There is no distance in thought, there is only immersion. All minds are united and all minds are ultimately free. The droplet bursts to engulf the lake, and the ocean, and infinity. The Bodhi-Tree is a symbolic representation of the individual's journey to infinity. As the seed which begins tiny and hard grows open and free, so should the mind and heart. The tree is rooted in the ground as the self is rooted in matter. But the seed grows beyond the ground, as it perceives its environment, cares about it, and ultimately leaves the limitations of the body and matter behind. The branches reach towards the heavens yet the vines of the banyan reach towards the earth. Such is the state of mankind - always being pulled in two directions. One direction is freedom, ultimate liberation, and the transcendence of boundaries. The other direction is security, rootedness, comfort, and tradition - the self that will not turn away from the earth. Some people may justify behavior by Buddhist or other ethics and ritual, but will ultimately seek comfort rather than freedom. Such people should rest peacefully at the roots of the tree and never climb it. For the others, the spiritual explorers, comfort and security are left behind. There will ultimately come a question: Which world do you choose? Only those who seek the upper branches of the tree and liberation can progress and follow the stages of the watches of the night. There were many reasons for the historical Buddha's incarnation. One was to provide a model for those that seek freedom. The Bodhi-Tree is an advanced practice partly because it requires that the practitioner be guided by an inner Buddhist spiritual guide or Yidam (tutelary deity). The practice should not be undertaken without such a guide. Since obtaining a guide is necessity before even beginning the practice, the first step is to contact a guide either by being initiated into a recognized Buddhist lineage, or through individual effort. To understand the role of the spiritual guide and how to obtain one, please click on the [ NEXT ] link below to continue.